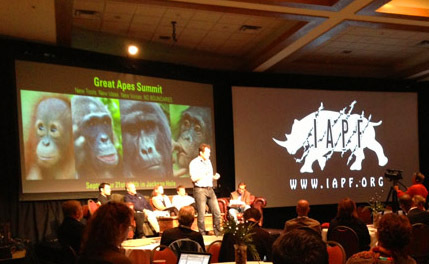 I-SITE CEO Ian Cross recently gave his opposable thumbs a work out at the Great Apes Summit in Jackson Hole, Wyoming previewing the upcoming mobile application ApeAPP. The Summit sponsored by I-SITE partner GRASP [The Great Apes Survival Partnership] and the Arcus Foundation brought together the world’s leading primatologists for three immersive days in late September. Great Apes, our closest cousins, are threatened by extinction, mainly due to habitat destruction, poaching and disease. Ian joined GRASP President Doug Cress on stage to preview the iPhone and Android application that I-SITE is developing with GRASP and their partners the African Wildlife Foundation, The Orangutan Conservancy, The Goualougo Triangle Ape Project and the Dian Fossey Gorilla Fund. The demo featured profiles of bonobos, gorillas, chimpanzees and orangutans along with current projects being run by partners in the field. The reception to the preview was extremely positive and other conservation organizations approached Doug and Ian after the session to express interest in being part of ApeAPP after it launches. Currently I-SITE and GRASP are completing the App and expect to have it in Google Play by the end of October and in the App Store soon thereafter. To find out more about ApeAPP and I-SITE’s conservation projects contact Ian.